Long Island is an extremely vulnerable region – susceptible to natural disasters ranging from blizzards, to heatwaves, to hurricanes. Recognizing the importance of being prepared and staying safe, United Way, 2-1-1 Long Island and PSEG Long Island launched BeReadyLI.org, a comprehensive online resource aimed at helping residents prepare before, during and after disasters. Stemming from this initiative, the BeReady Children’s Workshop was developed. It is crucial that all family members, no matter their age, know how to be prepared in case of an emergency. This interactive curriculum on emergency preparedness, filled with engaging videos, activities and take home packets, has reached more than 20,000 students across Long Island since its inception. 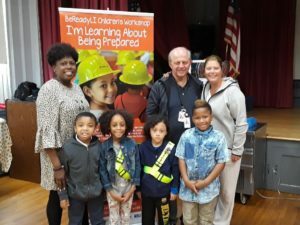 With June being recognized as the start of hurricane season, the workshop was especially timely as BeReady educators recently visited the David Paterson School in Hempstead helping 222 first and second graders be prepared in the event of an emergency. The assembly-style lesson began with a simple question to the students: What do they think of when they hear the word “emergency”? Replies ranged from calling 911 to finding the exit to knowing not to panic. From there, the students followed along with the presenters as they instructed kids how they can get ready for emergencies using props, clips from Sesame Street’s “Let’s Get Ready” special, and a question-and-answer interaction. At the end of assembly, the students recited a safety slogan that implements an acronym to help remind the kids what they should do in an emergency: “be Prepared, be Safe, in an Emergency, and Get ready.” Children left with goodie bags to bring home, containing a coloring booklet, a certificate of “Emergency Readiness”, a safety hard hat, and pages containing information from 2-1-1 Long Island and PSEG Long Island on how parents can prepare for emergencies with their kids. To learn more about BeReadyLI’s Children’s Workshop, visit http://www.bereadyli.org/bereadyli-childrens-workshop. Photo Caption: United Way of Long Island’s BeReadyLI Outreach Coordinator Nanette McNulty and PSEG representative Robert Wozniak join Principle Donnette Williams and students Antoine, Reina, Daniel and Day’Shawn at David Peterson School for the BeReadyLI Children’s Workshop, presented to 222 first through second graders.